On Friday 8th March WRc was delighted to welcome members of the Institute of Water SouthWest region to the annual Innovation Awards Dragons Den. Presentations were made by VEGA Controls Ltd (UK), Wessex Water, Arlington Packaging Limited and eviFile. Congratulations to Julian Britton of Wessex who won and who will entered for the national awards in June at IoW Annual Conference in Belfast, and also to George Lewis of Arlington who received Highly Commended from the judging panel. All 4 presentations were exceptional showcasing the latest and best solutions to support the challenges faced by the water industry. Our thanks to the three "Dragons", Barrie Light, Carmen Snowdon and Professor Ruth Allen, and to those who were able to join us on Friday. We all look forward to seeing who will win the national award in Belfast in June. WRc have been proud to have supported Macmillan Cancer Support for the past two years, hosting numerous events throughout the year to raise funds to go towards the emotional, physical and financial support Macmillan provides to those facing and living with cancer. 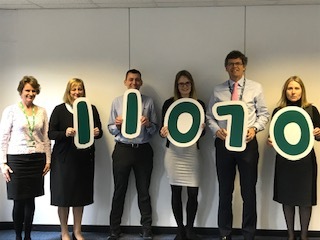 WRc were delighted to present Macmillan with the £11,010 raised by our charity team to go towards the amazing and essential work that they do. Come and join us at the next Wet Networks event where there’ll be a chance to hear about some of the latest technologies in the water sector and network with key water industry influencers. The successful series of Wet Networks events provides a platform for new and interesting technology companies to present to potential investors and water professionals. Wet Networks is a partnership between Arup and WRc, hosting a number of events across the UK and Internationally to promote innovations and collaborations across the water sector. The events are free to attend and we look forward to meeting you in Bristol on Wednesday 15th May. To book your place please follow the link below.